According to the players' contract this season, the first installment was to be paid before the start of the tournament while the second was due at the end of it. The third installment is to be paid within six months of the tournament's end. The BCB had taken over the responsibility of player payments this year after there were irregularities by the franchises in the inaugural edition of 2012. But as per the current process, the board needs to receive the amount from the franchises before paying the players. 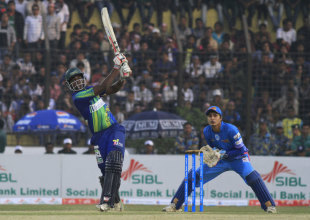 According to BPL secretary Ismail Haider Mallick, the BCB have only received money for the second installment from Dhaka Gladiators and Duronto Rajshahi. "It is true that five out of seven franchises haven't made payments after the first 25%," Mallick told ESPNcricinfo. "Our lawyers have told us that we have to wait till May 15 before sending out legal notices. We will take action if we are not paid by that time." "The BCB has taken up the responsibility of paying the players mainly because of what happened after the first edition of the BPL. We will continue to do so, but the franchises have to pay us the players' fees. Once they fail to make the payments, we will take out the bank guarantees to pay the players." Masakadza was bought in the players' auction for $30,000, but has only received the first 25% of the payment. He played in seven matches for the Royals, making 90 runs at an average of 12.85. "I was so excited when I was bought in the auction," Masakadza said. "The experience of being involved in the tournament was great but it has become a real disappointment since that our second payment is still due, and I've been waiting patiently for ten weeks now." Chigumbura echoed his Zimbabwe team-mate's concerns, reminding the Sylhet Royals to ensure payment. He averaged 44.33 with the bat, picked up 13 wickets and hit the most number of sixes in the tournament - 19. "I hope the organisers can arrange the payments very, very soon as we had our first payment during the event," Chigumbura said. "But the next payment does not seem to be coming. I have waited more than two months already since it should have been paid." "It's a shame because I have great memories of the tournament, as I finished as the highest six-hitter in the whole thing. But ultimately we are there to earn money, we love cricket, but it's also a job for us."